The minute I saw this application on the internet, I wanted to try it. Lucky for me I had my new Dell Axim X3i with me because usually applications like this one require a more powerful WiFi card than the Ambicom CF card I use with my X5. Actually, because this program has not been finalized yet and is still in development/testing, it actually only officially supports a couple of cards including the embedded WiFi unit on the HP iPAQ H4350 series. Turns out, it will work on at least one more. While I haven't checked it again any of my other cards, it does work with the X3i's embedded WiFi unit. Most people have seen the radar like WiFi scanner that was recently released. While that is neat, it doesn't actually show you where the access points are so there isn't a huge benefit for using it other than just for seeing what access points are available and their relative power. WiFi Graph is a stronger solution (in my mind at least), giving a graphical representation every second of available access points, their relative power, frequency, SSID and MAC address. Based on how many access points are in the area, WiFi Graph can show up to 16 separate graphs on the screen...but that makes each graph rather little. Six graphs fit well on the screen, and if for some reason you still have sixteen access points in the area, WiFi Graph can deal with that too (I'll talk about that a little later). WiFi Graph basically takes over your wireless card. 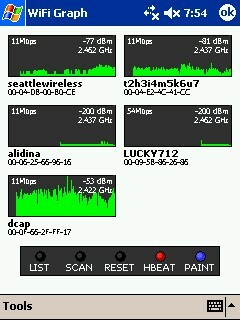 You can't really surf while you use WiFi Graph, but if you are using it you are likely looking for access points. One of the best applications for this program is war driving (finding access points). I used it around my house this afternoon, and while some of the access points I already knew about, because it makes a graph when it sees an access point, I was actually able to find more of the weaker access points as well that I don't normally see in the default WiFi scanners. The cool thing is, if you "lose" the access point and then "find" it again, WiFi Graph will continue plotting on the same graph. If you only have three graphs on screen, the inactive ones will be replaced with the most active, but as access point power changes, so does the graph display. This is how it can show more graphs on the screen then there are in the area. When you have a situation like a building at Microsoft, WiFi Graph will change quite a bit due to the large number of access points. While WiFi Graph puts all of its data right into XML files for parsing. Logs are placed in a special directory in My Documents, allowing for syncing with your desktop. It logs by MAC address, so each access point gets it own XML file that primarily contains the signal strength. Also contained in the log is the SSDI, if the access point is adhoc, if it is private (encrypted), and its frequency. 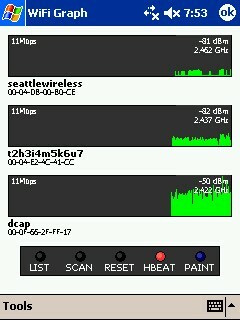 If you quit the application and get back in, it will show you the previous graphs for an access points. Also listed on the graph is not only the signal strength from the access point (almost distance but not quite) and the frequency of the access point, but also the speed of the access point. This makes it easy to tell which points are 802.11b vs. 802.11g. 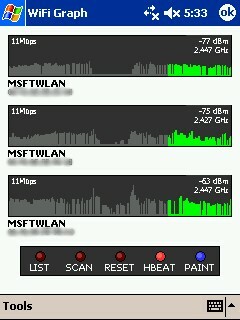 While it doesn't say which channel the access point is on, the frequency is directly related to the channel. Below the graph is a series of "lights." Really, I am not sure that they tell you that much except the scan light, which shows when it is scanning. 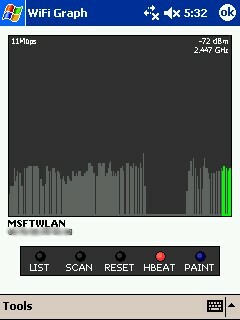 Again I must note that WiFi Graph is not stable at this point and/or compatible with every wireless card. This review is talking about a beta version of the product. In any case, I am extremely impressed by the product. At the current time the application is free for download, and to anyone who likes to find WiFi access points and doesn't mind potentially unstable software, this is a great download. The XML logging makes it great for easy integration with a GPS and map application. The application really does some smart things like showing you the most active access points (graphs), overlaying previous session data on a reconnect, and showing the speed of the access point. Assuming the final version works as well for me as this one, I would recommend that anyone using WiFi look into getting this great application to learn about the access points all around them. blank beanie wholesale . www.asiapokerindo.biz . What is bitcoin.